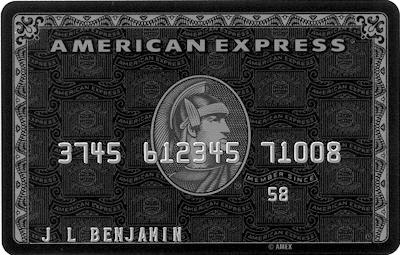 Would I ever use the American Express Platinum or Centurion (Black) cards? | Save. Spend. Splurge. 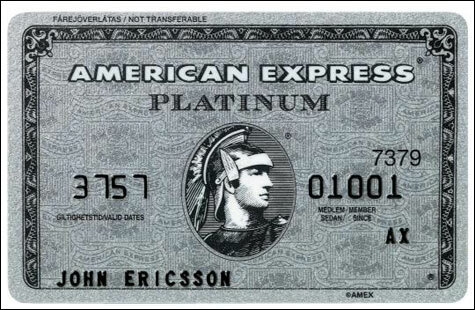 Home › Money › Discussions › Would I ever use the American Express Platinum or Centurion (Black) cards? Would I ever use the American Express Platinum or Centurion (Black) cards? American Express has these super uber high end charge cards, and Bridget of MAG, just recently got one. NOTE: They say “charge cards”, because whatever you buy, has to be paid in full each month. No credit allowed, or else you get a nice hefty 30% interest rate slap to the face, which is painful in more ways than one. *not really, but it should be for that price! SO WOULD I USE EITHER CARD? I would, if the benefits made sense for my lifestyle. Unfortunately, they don’t because I am not spendy enough in the areas where the card would end up benefitting me. A moot point with Amex, as it’s a charge card which means no credit limits allowed beyond the month, but it bears mentioning. I can actually pay for everything in cash, so I don’t technically need a debit or a credit card, but I like it when they give me added benefits I don’t have to pay for. Actually, I hate all fees, even though I understand that in SOME cases they are necessary. Bank fees, currency exchange fees, withdrawal fees.. you name it, I hate them. My 2 criterion for when I look for a credit card? Does it have points or cash back? I don’t really care about the interest rate on the credit card (I never leave a balance), and other perks like car rental insurance is nice, but I use it once in a blue moon. I don’t go to restaurants that often, nor order takeaway, so it’s completely useless as a benefit. The hotels and airline points rewards they mention are useless for me. When I travel on vacation, I stay at places like Ibis, which is the super budget hotel under the Accor Group. Their hotels are usually $100 a night on the high end, averaging around $80/night most times. When I travel for work, it depends on who’s paying. If I’m paying (this is usually the case), I stay at the cheapest possible hotel in a decently safe area with basic amenities (no sharing of bathrooms, for instance). To put it in perspective: I’ve been known to shack up at the Econolodge, which is a lot like the Motel 6 for my American readers (no joke). That horrified even the most hardened of travelers, such as BF. Otherwise, I consider Hilton or the Marriott to be the minimum if the client is paying. When I live in hotels, I stay at apartment hotels, which can be any kind of brand such as the Marriott Residence Inn. What does that all add up to in terms of Amex benefits? The only insurance I buy when I travel is health insurance. I pay about $52 for 4 weeks which is about $624/year (if I bought travel insurance for the year that is), and that’s only if I go out of the country. For work, I generally never leave the country (only 5% of the time). Other than that, car rental insurance is covered by Visa (which is why I have both a Visa and a Mastercard), just in case. I don’t really change my plans, nor do I change my flights unless something like a hurricane happens and they have to cancel my flight (in which case the airline does it automatically and even gives you a “I’m sorry” gift). That said, I have friends who charge everything to this particular Amex, earning 1.25 points and turning them into Aeroplan points. Apparently that is how they financed a yearlong trip around the world (he’s a consultant at a big company, she’s a stay-at-home-mom). If you do spend a lot of money on the card (if you travel for work, this is big) and you do plan on traveling a lot for pleasure, this is a good idea, and well worth that $699/year, as you can easily rack up over $2000/week at a minimum or more in spending when you travel for work (hotel, flights, eating dinners out, taxicabs), depending on where you fly/travel to. Otherwise, if you’re like me, it does zip for you because you’re spending your own money, and aren’t likely to spend over $2000/week (more like $2000 a month). Update: I think my friends said they spent about $3000/week average on that card between his job and their personal expenses. $3000/week x 1.25 points = 195,000 points a year. Plus, he was a frequent hotel guest at one single hotel chain and at one airline, so he racked up points there in addition to those Amex points. SO HAVE YOU, OR WOULD YOU CONSIDER THE CARD? ← How much should you have saved for retirement so far? It is admirable you are aware of your temptations! You aren’t missing out on much. I spend a lot but with 1% I get maybe $300 back a year. 🙂 on a busy year maybe $500 but it isn’t thousands!!! For me, it depends on the mix of stuff. We ended up with a TD travel card, as my spouse was staying in a hotel one to two times per month, on our dime. The rate on travel booked via their expedia site was 4.5% back, with 1.5% on everything else. We used an MBNA card for groceries and gas, then everything else on the travel card. Given our spending habits and rewards desires, I’m not aware of any other cards that would suit us better. To each their own. It depends on your lifestyle!! I agree with all the comments that it can make sense for some people, but not for me. I spend about $1,000 – $1,500 on my credit card a month, and it’s got no fees, plus I get points for free groceries, which I spend on make-up (of course!) with the PC Financial. The CIBC Aerogold/Infinite VISA card is having a promo right now where they waive your first year’s fee ($120) and also have a welcome bonus of 15,000 aeroplan points. I’m not sure I still qualify, as I used to have that card, but since cancelled due to the annual fee. What I like is that it’s a VISA, which is accepted everywhere, unlike the AMEX. I forgot about the Amex not being taken everywhere. It’s usually Mastercard or Visa, or both, hence why I have two for any situation. I’d go for that CIBC Visa, and then cancel it, but did you know that PC Mastercard as a PC WORLD card right now? The only difference is you get 20 points for every $1 spent at PC stores like Loblaws, No Frills, etc. Platinum card fee is $450 a year and your apparently’s on the Centurion are incorrect. I checked, and updated the blog with the link and screenshot to the $699/year fee. In addition one of my “apparently”s was a joke and the other two are just what I read, although the one about being invited is true, and possibly the only criteria. I have also updated my post to make that clearer. Are you looking at a Canadian site? http://www304.americanexpress.com/getthecard/learn-about/Platinum-Card I pay $450 a year for my Platinum card and have since they increased from $375 in 2007. I agree with you. I had the Platinum card while I was traveling every week for work as a consultant because I was expensing $2000+ a week. I signed up with a huge points bonus (something like 50,000?) and yearly spending credit ($200/yr back in travel expenses for things like luggage check-in, on flight internet, etc), which were greater than the first year’s fee. Now that I do not travel for work, I have since canceled the card. I do miss the perks (lounge access in airports, etc) but I can’t justify the cost. There was an Amex blue card in the US everyone raved about because the points were even better than this one in Canada, plus a SMALL annual fee!! Honestly, these particular cards wouldn’t make sense for me personally. I don’t travel for work (anymore), and I don’t spend enough on my credit cards every month to balance out the cost of the annual fee. Do I think it’s a good idea for some people? Sure, but not for me. That’s me. If I was working at a company and traveling A LOT then it makes sense. Otherwise, the way I work, I don’t travel much to make it worth my while.